Are you interested in pursuing a Diploma in Early Childhood Education and Care (CHC50113)? 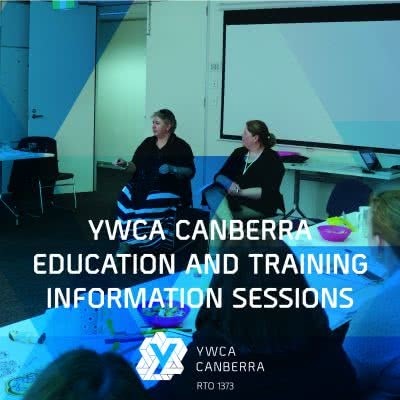 YWCA Canberra is a registered training organisation (RTO national number: 1373) that provides a range of nationally recognised qualifications. The Diploma in Early Childhood Education and Care provides students with the skills and knowledge to apply organisational policies and procedures, plan activities and care for children while facilitating their education and play, enabling them to achieve their developmental outcomes. This qualification is a great way to build on a Certificate III of Early Childhood Education and Care (CHC50113). Come along to our information session to find out about enrolment, fees, and program requirements. Our friendly trainers will be on hand to answer all of your questions. YWCA Canberra is committed to ensuring that our membership and events are accessible and engaging to a wide range of people within our commuinty. If you identify with one or more of the following we invite you to share your identity with us. YWCA is a Public Benevolent Institution registered as a Charity endorsed with both Tax-exempt status and DGR (Deductible Gift Recipient) status. All transactions are encrypted using 256-Bit SSL technology. Thank you for your purchase. The primary ticket holder will receive an email shortly with the purchase details. Thank you for your registration. The primary ticket holder will receive an email shortly with the event details.